Warner Bros rehashed spy property The Man From U.N.C.L.E. may have had a dismal showing at the box office this summer, but that doesn’t mean the studio has lost all faith in the property. They’ll just be changing mediums for their next attempt. The 1960’s spy thriller will be teaming up with another 1960’s TV hero in the four-color world. 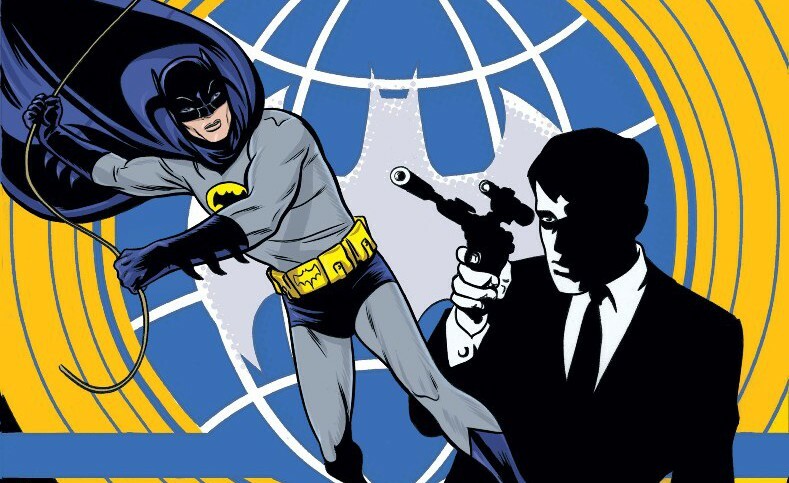 DC Comics has announced that its wildly successful Batman ’66 will have a two issue crossover mini-series with The Man From U.N.C.L.E. this winter. U.N.C.L.E. when the latter’s enemies – the villainous terror organization known as T.H.R.U.S.H. – begin recruiting various enemies of The Dark Knight to fill out their ranks. The series will travel from the dark alleys of Gotham City to the locales of Europe to take care of the bad guys. Regular Batman ’66 writer Jeff Parker will handle scripting duties while David Hine will handle art chores. The parent series tells stories in the vein of the campy and family friendly way of the 1960’s Batman TV show which starred Adam West and Burt Ward as Batman and Robin respectively. This won’t be the first team-up for the comic book series. Last year we saw Batman ’66 Meets The Green Hornet, which used continuity from the two shows (which did crossover back in the day) to create an interesting and fresh story. Batman ’66 Meets The Man From U.N.C.L.E. is slated to hit comic book stores December 23. This entry was posted in Breaking News, Comics and tagged Batman '66, The Man From U.N.C.L.E. Bookmark the permalink.